The ushering in of the railroad era in the United States in the early nineteenth century offered a host of new opportunities for the young country. Railroads offered a means to more fully expand into the West, and offered future Americans the opportunity to travel throughout the country. The proliferation of the railroad led to the founding of new towns throughout the country which were hub stops on the railway. However, once the invention of the automobile took off, the ease of travel by car overshadowed that of the railroad. Railroads still serve an important role in our economy, but have moved away from providing a source of transportation for individuals. However, the repercussions after a railroad accident are often ere and can have long lasting implications on the victims. In 2014, railroad acid accounted for 5 fatalities, and approximately 40 severe injuries. While this number may seem small when compared to the typical car accident, it should not be overlooked that the resulting injuries are often much more severe than the typical car accident. The impact of a car or truck against a huge railcar could lead to catastrophic damages. Florida is a comparative negligence state, which means that the actions of a victim will be taken into consideration when determining the amount of damages, although it will not prevent the awardance of damages. If a victim was found to be a percentage at fault for the railroad accident, the total amount of damages will be reduced by the at-fault percentage. Victims of railroad accidents are often unable to easily walk away from the accident and may require months of extensive care and physical therapy to simply continue on with their daily activities. Severe injuries might require lifelong care and the inability to hold a job in the future. An experienced personal injury attorney will work with you and your family to draft a claim for damages which will take into consideration the facts of the accident and the resulting injuries. An insurance company may attempt to contact your family to coerce a settlement. However, it is important to consult with an accident attorney prior to signing a settlement, since the settlement may prevent you from filing a claim in the future. Many expenses stemming from the accident will not reveal themselves fully until years after the accident – if you have already signed a settlement agreement, you will be saddled with the financial burden for these resulting expenses for an accident which was not your fault. 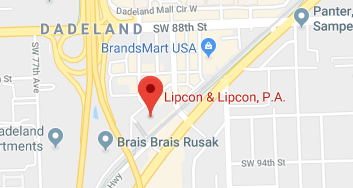 If you or a loved one have been injured in a railroad accident, do not hesitate to contact the attorneys of Lipcon & Lipcon. Our railroad accident attorneys have over 60 years of combined experience in handling personal injury claims, especially those resulting in catastrophic injuries. Railroad accidents are not easy to walk away from, and it is imperative to us that we ensure you receive the compensation you deserve for your injuries. Contact our Miami office today for your initial free consultation.